HA: .... I was intrigued with the idea of creating new characters and titles in an already established universe. The Valiant Universe is still so young and fresh and there’s so much here ready to explore. I can’t wait until you see what we’ve been cooking up! I am totally on board with new stuff. But as we've talked about in other threads regarding editorial control, I hope HA has the wisdom to connect the new with some of the old; to reach back into the book and tie it all together. To not forget where Livewire came from, her backstory, her connection to Harada and the reasons for leaving him. That's what a good editor does. HA: When working on high-profile properties and characters, publishers have the luxury of a pre-established fanbase for their books. New characters don’t have that same privilege of years of loving and adoring fans. But that’s what makes creating new characters and new worlds such a fun and unique challenge! It’s all about how we can make characters like Livewire interesting and relatable to a new audience. Hey Heather I was reading Valiant when you were 2 years old. [Hey Heather I was reading Valiant when you were 2 years old. Isn't that her point? There's already a fanbase for X-O, Bloodshot and Ninjak. It's not as hard to get people to pay attention to them as a newer character like Livewire or Punk Mambo. I don't really get the hate people have for HA. Admittedly, I know nothing of her prior to her recently joining Valiant. I started following her on twitter though and she certainly seems committed to trying to improve the profile of the company and in trying to find new talent. I would have thought that's something we should be applauding. 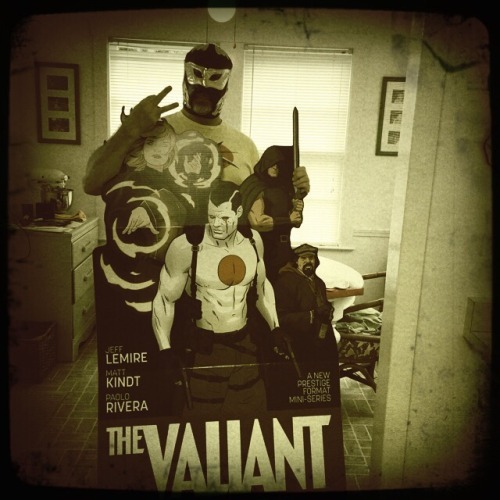 Didn't Dinesh himself, and Eric Heisserer both mention that Valiant didn't have much of a pre-established fanbase? Heisserer specially mentioned that when he was writing the script for Harbinger the lack of a large fandom for Valiant and absence of any history of adaptions gave him the freedom to do what he wanted with the characters. Valiant's obscurity has always been its main selling point. Also considering that no Valiant comics were published between 1998 and 2012, I think it's completely fair to say that Valiant is light on source material compared to Marvel and DC. Considering its sporadic publishing history, Valiant doesn't really have much of a pre-established fan base. A significant percentage of the people reading Valiant now are here because of the goodwill established by the 2012 relaunch. DC can say that it started expanding its fanbase with the Adam West Batman series from the 1960s. Marvel expanded at roughly that same time with its various Spider-Man shows. Meaning both companies have over 75 years of publishing history, and over 50 years of media adaption history. Marvel and DC have been pop culture staples since the 1960s. Valiant on the otherhand, is completely unheard of. The bulk of Valiant's publication history, and its media adaption history will have all taken place post-2012. When my younger brother's friend saw my Bloodshot comic, he thought it was Captain Atom from the Justice League cartoon. Captain Atom, who played a brief role in an animated show from over a decade ago, is more recognizable than Bloodshot. So yeah, Valiant has been working from scratch in nearly every department for the last seven years. Especially with the whole history of VH-1, Acclaim Valiant, and VEI. When my younger brother's friend saw my Bloodshot comic, he thought it was Captain Atom from the Justice League cartoon. Captain Atom, who played a brief role in an animated show from over a decade ago, is more recognizable than Bloodshot. Well, a nationally run cartoon will have the effect. But I get your point. As for the pre-established fan base thing, I think we're nit-picking her words an little too finely. Compared to starting a book completely from scratch, the character does have an existing fan base.